From the west (Leesburg, Purcellville, Berryville, Winchester): Take Route 7 East. At the 1st light after Route 15, make right turn onto Cardinal Park Dr SE. Take 1st left onto Trailview Blvd. Follow Trailview all the way back, past the library and sheriff’s office, and around the building to the Church of the Holy Spirit. From the south (Manassas, Centreville, Chantilly): Take Route 28 North. towards Dulles Airport. Follow 28 North to VA-7 West/Leesburg Pike. Travel 6.6 miles on Route 7 to the traffic light at Cardinal Park Dr SE. Make left turn onto Cardinal Park Dr SE. Take 1st left onto Trailview Blvd. Follow Trailview all the way back, past the library and sheriff’s office, and around the building to the Church of the Holy Spirit. From the east (Tyson’s Corner, Arlington, Washington DC): Take 66 West. Take Exit 67 – I-495N toward Baltimore/Dulles Airport. Merge onto VA-267 West. Take exit 9B and merge onto VA-28 N toward Sterling. Follow 28 North to VA-7 West/Leesburg Pike. Travel 6.6 miles on Route 7 to the traffic light at Cardinal Park Dr SE. Make left turn onto Cardinal Park Dr SE. Take 1st left onto Trailview Blvd. Follow Trailview all the way back, past the library and sheriff’s office, and around the building to the Church of the Holy Spirit. From the north: From Frederick, MD – Take 15 South towards Leesburg. Take the exit for Route 7 East. At the 1st light, make right turn onto Cardinal Park Dr SE. Take 1st left onto Trailview Blvd. Follow Trailview all the way back, past the library and sheriff’s office, and around the building to the Church of the Holy Spirit. From Batlimore, MD – Take I-70 West. 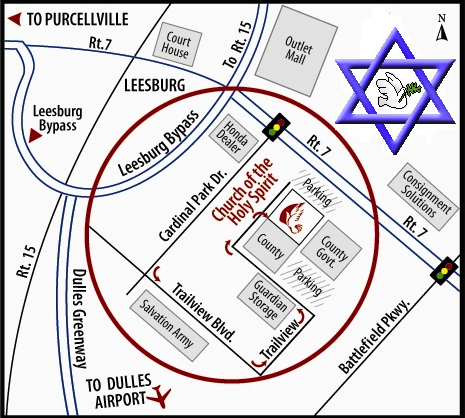 Take Exit 52 for US-15 South toward Leesburg. Take the exit for Route 7 East. At the 1st light, make right turn onto Cardinal Park Dr SE. Take 1st left onto Trailview Blvd. Follow Trailview all the way back, past the library and sheriff’s office, and around the building to the Church of the Holy Spirit.